You know of my longstanding passion for barbecue. What you may not know is that I came to this field—circuitously for sure—through a degree in French literature. After college, I traveled to France on a Watson Foundation Fellowship to study medieval cooking in Europe. But how can you study the history of cooking if you don’t know how to cook? So I enrolled in a brand new cooking school in Paris called La Varenne. It was there that I met a fellow student and soon to be fellow food writer, Susan Hermann Loomis. We all loved France, but Susan fell so head over heels, she wound up living there permanently. She still lives there today in the town of Louviers in Normandy, where she runs a cooking school called On Rue Tatin. We didn’t talk much about grilling back at La Varenne. The French don’t. But that doesn’t mean they don’t love putting food to live fire. 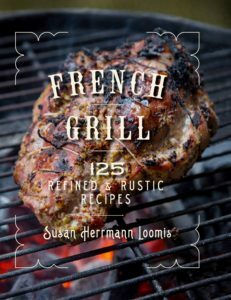 Susan has written an excellent book filled with stunning photos and practical tips on what I call the occult art of French grilling. 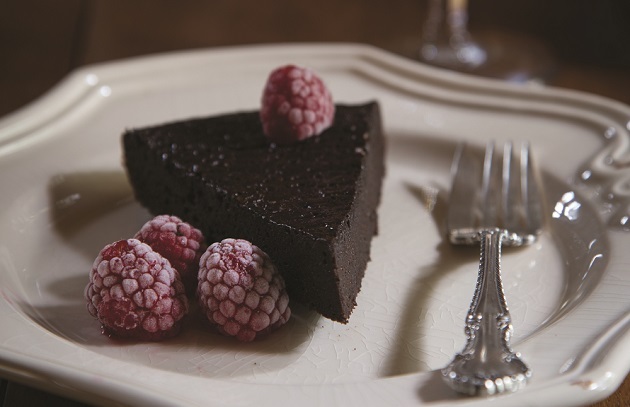 I trust you’ll find her engaging prose and innovative recipes as irresistible as I did. Susan is an insider’s insider. So savor her book and fire up the grill! The French are masters at the grill. Once the temperatures rise and the sun comes out, so do grills of every shape and form. I love biking through my town just outside Paris in the early spring, when we get a flurry of warm weather before the rains return, because the aromas of the grill fill the air. If I’m not hungry when I began my bicycle voyage, I’m starving by the time I get home. And inspired to pull out the grill. Restaurant chefs in French cities, currently trending towards the grill, keep their fires lit year-round. I thought I knew a lot about grilling when I moved to France thirty years ago, but I’ve learned much from my French compatriots. One of the biggest things they showed me was their absolute horror of using anything but wood to make a fire. I realized, as I ate the rare, juicy, perfectly browned steaks, the crisp-crusted ribs, the perfectly charred sausages, that they were right. Today it is so easy to be like the French and use either pure wood, or pure wood charcoal briquettes, or charcoal briquettes that are wood and something sustainable, such as potato starch. I’ve learned from my French grilling mentors to do a combination of fuels, lighting a fire with charcoal briquettes and lump charcoal, then adding branches of apple, hazelnut, or pear, and topping it all with a bit more lump charcoal. This creates a wonderful and long-lasting heat source for foods on the grill. The French are particularly good at grilling meat, which they love rare inside, and crisp on the outside. This might make you think their fires are hot, their cooking times swift. But no, the French go “low and slow” on the grill because they know that meats react better to heat that sears but doesn’t burn, and is absorbed slowly. 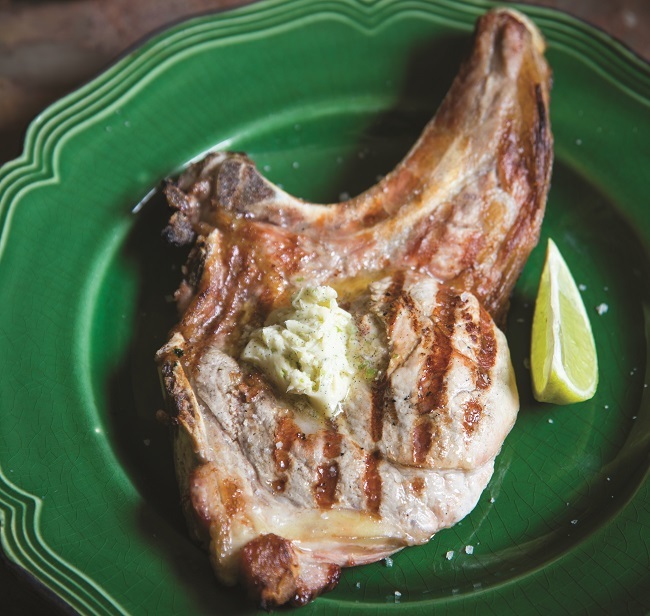 Thus, a fat pork chop takes nearly a half and hour and comes off the grill moist, tender, and juicy. Skinny little sausages that make up the heart of the country French grill repertoire, chipolatas, are turned, coddled, and cared for, and transformed into moist little bites of flavor. And that beef rib? Count at least 20 minutes, turn it at least three times, watch it but don’t hover. You’ll see—it’s blood red and tender, and perfectly grilled. The French are discovering the art of grilling vegetables, too. Already experts with the potato, they now put them on the grill after a little brush with oil and salt, and they emerge golden, fluffy and, most of all, completely tender. Again, the bywords are low and slow—for asparagus, for tiny spring carrots, for radishes, turnips, and beets, the sweet potato and much more. The French tend to purchase their food directly from the hand of the person who raised or cultivated it. Already filled with flavor, any French grill cook worth their salt knows to get out of the way and give foods the “kiss of smoke”. Nothing heavy, just the delicacy of the grill to overlay the beautiful flavor already there. Occasionally a vegetable needs a quick pre-cook before getting that French kiss; this is easy, and usually done in a steamer. It’s appropriate for root vegetables like beets, winter turnips and parsnips, thickly sliced celery root, even the noble artichoke. Yes, the artichoke turns into a piece of heaven on the grill, with a pool of garlic and parsley sitting in its heart. Seasoning is primordial to the French chef in general, the French grill chef specifically. I’ve copied French grill chefs in their seasoning method, because it works so well: drizzle a small-ish flat platter (large enough to accommodate spears of asparagus and thin carrots) with extra-virgin olive oil, sprinkle in some sea salt, mix it all up, then right before you put your vegetables on the grill, roll them in this mixture and voila! Perfect seasoning. Pepper can be added later. The same goes for meat: rub a tiny bit of extra virgin olive oil all over the surface, but hold the salt. Add that once the surface is grilled, and the pepper once the meat is off the grill and resting. With FRENCH GRILL, you’ll not only take a little trip through grilling in France, but you’ll get some take-aways that will make you an even better grill chef then you already are, à la Française. Use charcoal hardwood lump charcoal as well as a sustainable charcoal, blended. There, are many brands available including: Weber briquettes (wood and potato starch), Pok Pok Thaan Thai Charcoal, Binchotan, The Original Charcoal Company, to mention a few. If you’ve got fruit or nut-wood branches that have been air-dried for at least a year, add those for a touch of extra flavor. Prepare your “seasoning plate” with oil and salt, for vegetables. Lightly oil meat before it goes on the grill, with extra-virgin olive oil. The operative word is “lightly”. Use a drip pan, and put coals to either side of the grill once they’re hot and read for cooking. This way, no acrid smoke flavor. Salt and pepper meat once it has been grilled. For example, put that fat, lightly oiled chop on the grill and just after you turn it, salt and pepper it. That way the salt melts into the meat while it is grilling on the other side, and the pepper lends its flavor. Pay attention to “low and slow” and take time to cook and turn your vegetables and meats, moving them on and off the coals, making sure they cook all the way through to give you their ultimate flavor. Give a quick salting to all foods again, once they’re off the grill. All photos by Francis Hammond, reprinted with permission of The Countryman Press.